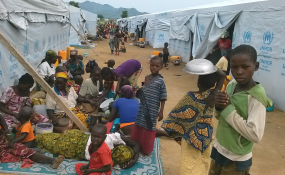 Maiduguri — The United Nations Refugee Agency (UNHCR) and the Economic Community of West African States (ECOWAS) country representative, Antonio Canhandula, have said that the Federal Government would recognise 20,485 Cameroonian refugees on a 'temporary protection basis'. Canhandula disclosed in a statement in Maiduguri yesterday that the refugees were informed of government's decision to recognise them on a temporary protection basis. "Our mission was to access the needs of refugees and draft a protection strategy for the Cameroonian refugees' situation in Nigeria," he said. On the continued influx of refugees, Canhandula said: "The UN refugees' agency and national authorities will continue with their registration to track their influx into Nigeria. "The presence of registration officers will improve tracking and registration of new arrivals from Cameroun. Registration officers will be able to cover Akwa Ibom and Taraba from their bases in Cross River and Benue at the same time."